I volunteered at the annual corporate meeting. One of the tasks was “penguin handler” as one of the volunteers would be wearing the penguin mascot costume. The visibility is very limited, plus someone was needed to take pictures of people with the penguin. Of course, I had to volunteer for that position. It might not have been quite as exciting as being the penguin, but I did get to see the look of surprise and happiness on everyone’s faces (even the people going to Starbucks who had nothing to do with the event) that there was a giant penguin. It was also my job to convince people to get their picture taken. Some were so eager they just jumped right over, others had to be convinced, and some wanted nowhere near the penguin. It was incredible to see people’s reactions to the penguin. Waves, laughs, whispers of “do you see that?” A giant penguin really makes people happy. 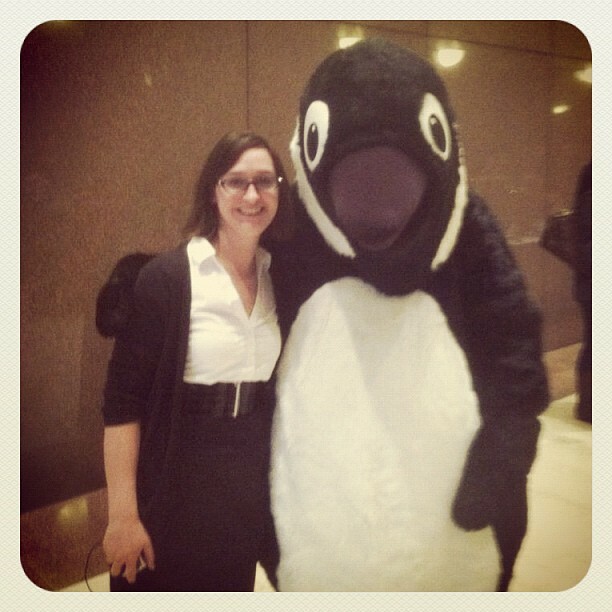 I also escorted the penguin across the stage for the raffle at the end of the corporate presentation. I successfully kept her from tripping over anything or running into anyone. Hopefully, next year, I will be the penguin.